Reigning Indy Lights Champion Ed Jones will step up to the pinnacle of US open-wheel competition in 2017, after agreeing terms to contest the fiercely-disputed Verizon IndyCar Series with Dale Coyne Racing. Jones made an immediate impression on the ‘other’ side of the Pond when he steered his burgeoning single-seater career stateside in 2015, claiming pole position on his debut with Carlin and winning his first three races en route to third position in the final standings. With a season’s experience under his belt, the talented Dubai, UAE-based ace was even more of a force to be reckoned with this year, and at the end of an intensely hard-fought campaign, he duly clinched the coveted crown. His polished performance and standout success brought Jones to the attention of a number of IndyCar outfits, and after holding talks with several different teams, the 21-year-old Brit has put pen to paper for Dale Coyne Racing – a squad with multiple victories and podium finishes to its credit. “I’m hugely excited to be stepping up to the Verizon IndyCar Series next year with Dale Coyne Racing,” he enthused, “and to reach an agreement as early as we have done is great news as it gives me plenty of time to settle into the team and get to know everybody properly so we can prepare as well as possible for the season ahead. Dale Coyne has a reputation within the paddock for mentoring and bringing the best out of young drivers, and his eponymously-named team has also been a happy home for a number of Brits, with Mike Conway and the late Justin Wilson having both won races for the Illinois-based operation. Jones acknowledges that was a seriously persuasive factor in his decision, not to mention the opportunity to line up alongside Sébastien Bourdais, a multiple Champ Car Champion and a man with prior F1 pedigree. “Although we spoke to a few teams, Dale Coyne Racing always stood out as the best option and Dale worked hard to make the deal happen,” revealed the former European F3 Open Champion. “DCR might be a small team, but it is also one that has regularly produced giant-killing performances and punches consistently above its weight, and I think Seb’s recruitment for 2017 will be the catalyst for a real step forward. “He’s one of the best team-mates I could ask for during my rookie season as I get used to everything; he has a wealth of experience in the sport that I can draw upon and he seems like a really open and approachable guy. Not only that, but he will be an excellent benchmark too as he is clearly still one of the fastest drivers in the series, so for me, it’s the ideal scenario and I’m sure we’ll establish a strong working relationship to really push the team on. “It will obviously be a sizeable step-up from anything I’ve done before, with longer races, pit-stops and a vital strategic element. Indeed, strategy is one of the areas in which DCR has always excelled – again, aided by Dale’s knowledge and experience from his own competitive career – and the role it plays in IndyCar can never be underestimated, with races frequently won and lost by split-second decisions. For my maiden campaign in the series, I really couldn’t be anywhere better. Team Owner Coyne echoed those sentiments, whilst paying tribute to the Williams-Harfield Sports Group protégé’s eye-catching achievements since first setting foot on the Mazda Road to Indy ladder and sharing his new charge’s optimism and high hopes for the adventure that lies ahead. 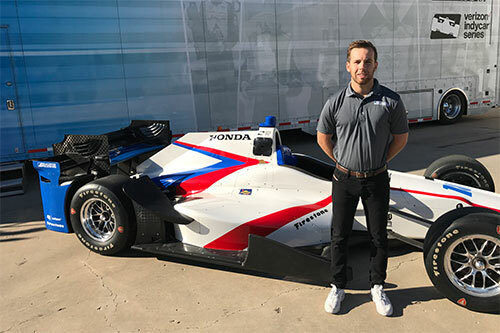 “Ed had a couple of remarkable seasons in Indy Lights, and we’re very excited to have him join our team for his rookie IndyCar campaign,” affirmed Coyne. “I attended the Indy Lights finale at Laguna Seca and Ed demonstrated a lot of poise, maturity and determination while under pressure, knowing that the championship was on the line. Those are all qualities that will serve him well in IndyCar. I was very impressed by what I saw.